The weather has been absolutely dreadful of late. Yet the hens love to be outside - having said that, having just checked the henhouse (6.30pm Tuesday) they are all in for the night. Around teatime I always throw them a small supper - tonight it was bread and kale. Whilst I have witnessed some hens eating raw kale ours prefer it cooked - and with bread! lol! This is a list of everything you can feed a chicken. However, everybody's chickens have their own tiny brains full of likes and dislikes, so while one person's chickens may come running for grapes or watermelon, another person's chickens may turn up their pointy little beaks at it. Anything on this list is worth a try. Apple seeds contain cyanide, but not in sufficient quantities to kill. Okay to feed, but not a favorite. High in potassium, a good treat. Well-cooked only, never dry Also, greenbeans. All kinds A treat, especially strawberries. All kinds - good use for stale bread or rolls Feed starches in moderation.
. Tuck into a suet cage and they will pick at it all day. Whole head - Hang a whole cabbage from their coop ceiling in winter so they have something to play with and greens to eat. They like carrot foliage too. Avoid highly sugared cereal such as Cocopuffs, etc. Can be bought at bait or pet-supply stores. Great treat – provides protein and it’s fun to watch the chickens catch them. Let mature for yummy seeds and flesh. For chicks, cutting them in half makes it easier for them to swallow. Great fun - the cause of many entertaining "chicken keepaway" games. Only feed your chickens that which is still considered edible by humans, don't feed anything spoiled, moldy, oily, salty or unidentifiable. Any leafy greens, spinach collards, chickweed included. A big treat, depending on how much other greenery they have access to. Available at pet supply stores or on the internet, although shipping is expensive! A huge(!) favourite treat, probably the most foolproof treat on the books. Meat scraps of any kind. Both seeds and flesh are good chicken treats. A favourite treat, fun to watch them eat it, but not much nutrition. Raw Seeds are a big treat. Popped, no butter, no salt. Both seeds and flesh are a nutritious treat. Cooked only Pilaf mixes are okay too, plain white rice has little nutrition. Wheat and oat sprouts are great! Good for greens in mid-winter. Sunflower seeds with the shell still on is fine to feed, as well as with the shell off. A good treat, helps hens lay eggs and grow healthy feathers. Served cold, it can keep chickens cool and hydrated during hot summers. Seeds and flesh are both okay to feed. A big favourite and good for their digestive systems. Plain is better. For more amazing facts and fun follow the ABC Wednesday link in my sidebar. Jon needed a new work's vehicle - it needed to be larger than the current one for weight/capacity reasons. We went along to the salesroom and I had my first sit in the VW Transporter. It seemed very large. Whilst it was Jon's decision and that decision was based on a business need I just felt it was a tad too big for me - considering my vehicle - the Toyota Hilux 4x4 was also a large one. I suggested to Jon I got a run-around small car - suitable for my tootling about to the shops and also for my shopping expeditions with Mrs Nesbitt Senior. At the ripe old age of 82 a smaller car was more suited to her needs too. We started looking around for smaller cars - the Toyota will stay - such as the winters may deem necessary! One thought would be to tax the pick-up for 6 months of the year - but when we did our homework and found cars which are taxed at £20 a year we could tax the car all year, the pick-up just if we have a severe winter. After weeks of research and haggling we came away Citroen C1 - 4 years old but with one previous owner a 60 year old gal who regularly had it serviced and who bought a new car every 4 years from the Citroen dealer in Sunderland. Low mileage too!£20 a year to tax and a top mileage to the gallon statistic! We collected the car last week and we have been thrilled with its performance and well impressed with the miles to the gallon - I think 56 was one day's average! Next stop was Jon's work's van. 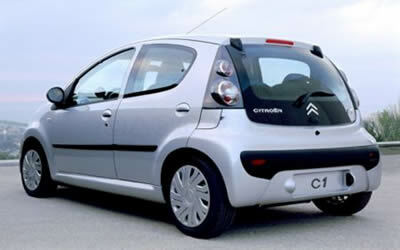 With my car secured and bought it was ideal to use when shopping around for the best deals. By travelling to Preston we saved £1,000 from the price stated nearer to home. 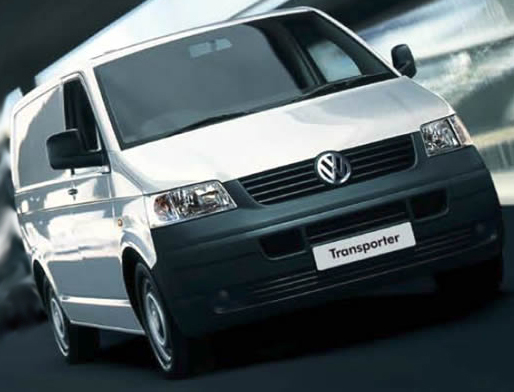 We have plans for the transporter too - we plan to make modifications so we can spend the odd times away camping!!!!! Here are some of my favourite replies to the question Why did the chicken cross the road? Original answer : To get to the other side. Al Gore: I invented the road and the chicken, but I regret inventing the chicken. It emits too many greenhouse gases. L.A. Police Department: Give us ten minutes with the chicken and we'll find out. 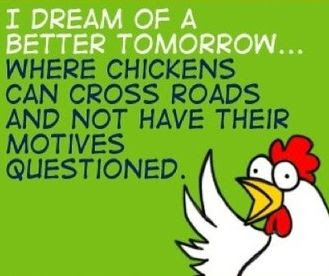 Grandparents: In our day, we didn't ask why the chicken crossed the road. Someone told us that the chicken had crossed the road, and that was good enough for us. And besides that, it had to cross it barefoot, while walking 10 miles to school in the snow before breakfast. Charles Darwin: Chickens, over great periods of time, have been naturally selected in such a way that they are now genetically predisposed to crossing roads. Besides, it was the logical next step after coming down from the trees. Robert Frost: To cross the road less travelled by. O.J. Simpson: It didn't. I was playing golf with the chicken at the time. Gilligan: The traffic started getting rough; the chicken had to cross. If not for the plumage of its peerless tail, the chicken would be lost ... the chicken would be lost! Forrest Gump: My mama always says, "Stupid is what stupid does." Queen of Hearts: It doesn't matter. Off with its head. Sherlock Holmes: Elementary, my dear Watson. She was chased across by a nine-month old white Persian cat with a broken tail and a rose thorn in its right forepaw. But why it crossed it, I've not been told! Colonel Sanders: Did I miss one?! I was intrigued the other day, I noticed my bucket had been knocked over. This is the container I use to move the woodshavings from the garage to the henhouse. Somebody had used it as a nesting spot! I did catch a glimpse of a brown head popping over - so it is either mabel or Olwym! The usual egg laying continues in the corner of the henhouse - Bev's blue eggs Eva or May and Olwyn or Mabel. Mabel/Olwyn lay the longer eggs as seen on the right. Inside the henhouse Bev seems to be in her usual position - now it would seem Eva is there too. Meanwhile Ernest and mabel are still as close as ever. May is also nestling next to Ernest (far left) whilst Olwyn sleeps nearest the door! For more ABC fun visit the link in my webside - but for now, that's the intriguing insight into what is going on with of the Nesbitt Chickens! Hybrid Chickens After the 2nd World War people’s demands and expectations changed and they wanted fresh eggs all year round, as they now had refrigerators to keep them in. This meant there was a massive demand for eggs pushing prices higher. The hens being kept at the time were unable to reliably produce 300+eggs a year each. Unfortunately the demand for plentiful cheap eggs also produced the development of what we now know as the "battery cage" system. Genetics were just becoming “the in thing” in the scientific world and known good layers were crossed using genetic formulae to develop the hybrid chicken that would continually lay well for 2 years. Chicken breeders were quick to realise that we didn’t want just brown birds in our gardens but that some us did want hens that laid all year. So they started breeding chickens that are still primarily a hybrid but are much more varied in colour. There is now a large variety of hybrid chickens available. Ambers, Blacktail, Bluebelles, Columbine, Copper Black, Rangers, Rhode Rocks, Speckledy, Sussex, White Stars. The list is in fact almost endless, as every country around the world will have breeders with their “own” hybrids. When buying a hybrid chicken you will be paying a fraction of the cost of a breed bird. Hybrid chicken prices do vary dependent on where the bird originated from. Many will have been hatched by commercial hatcheries and done so by the thousand. Many of these chicks will be sold as early as one day old to a second “breeder”, to be "grown on" and eventually sold to us as POL/point of lay hens at around 16-24 weeks of age. Some of the “grown on” birds are now being sold to a third party, garden centres, before eventually reaching the back garden hen keeper. As you can well imagine, purchasing hens through these outlets is one of the most expensive ways of acquiring your hens. I recently saw Warrens marked at £25 per bird in a garden centre, yet a near-by breeder of Ambers was selling POL for £16!